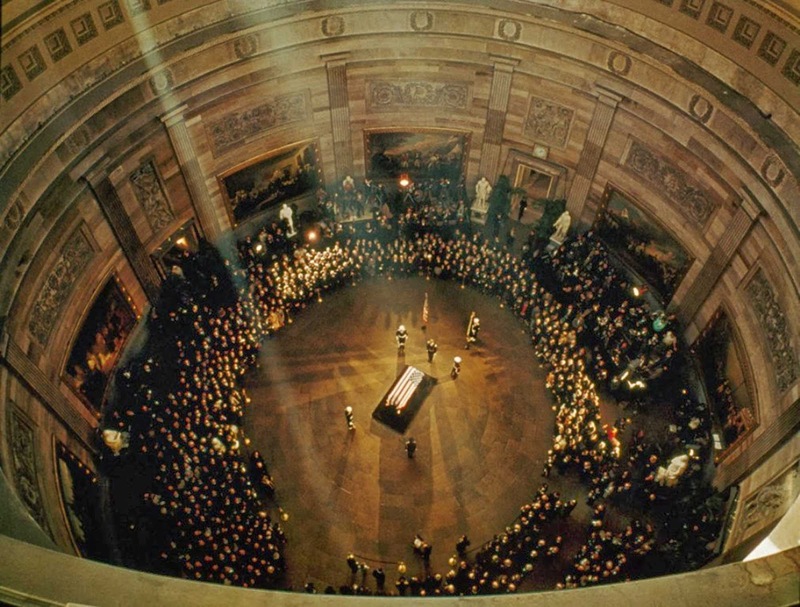 The body of President John F. Kennedy lying in state in the U.S. Capitol rotunda, November 24, 1963. On November 24, 1963, about 300,000 people watched a horse-drawn caisson, which had borne the body of Franklin D. Roosevelt and the Unknown Soldier, carry Kennedy’s flag-covered casket down the White House drive, past parallel rows of soldiers bearing the flags of the 50 states of the Union, then along Pennsylvania Avenue to the Capitol Rotunda to lie in state. The only sounds on Pennsylvania Avenue as the cortège made its way to the Capitol were the sounds of the muffled drums and the clacking of horses’ hooves. The widow, Jackie Kennedy, holding her two children by the hand, led the public mourning for the country. In the rotunda, Mrs. Kennedy and her daughter Caroline knelt beside the casket, which rested on the Lincoln catafalque. Three-year-old John Jr. was briefly taken out of the rotunda so as not to disrupt the service. Mrs. Kennedy maintained her composure as her husband was taken to the Capitol to lie in state, as well as during the memorial service. Brief eulogies were delivered inside the rotunda by Senate Majority Leader Mike Mansfield of Montana, Chief Justice Earl Warren, and Speaker McCormack. 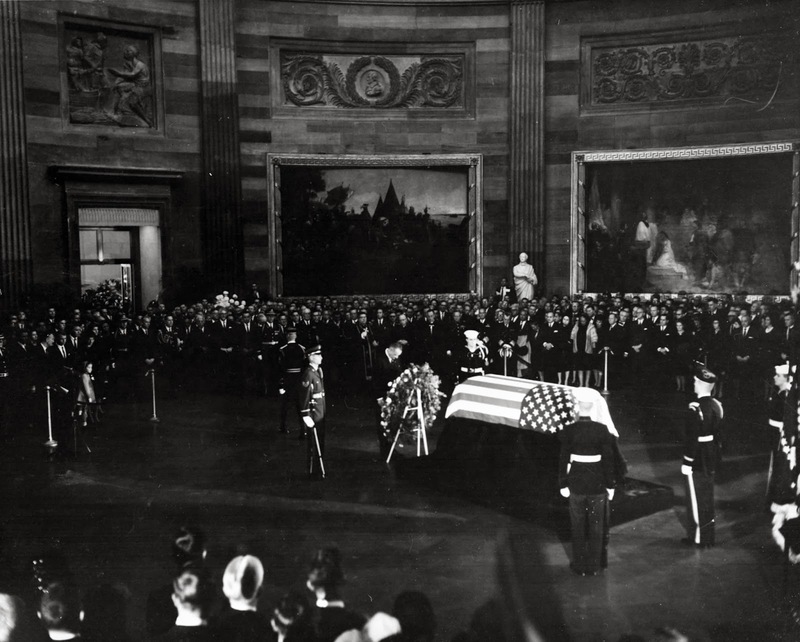 Kennedy was the first president in more than 30 years to lie in state in the rotunda, the previous one being the only president to ever serve as chief justice, William Howard Taft, in 1930. He was also the first Democrat to lie in state at the Capitol. 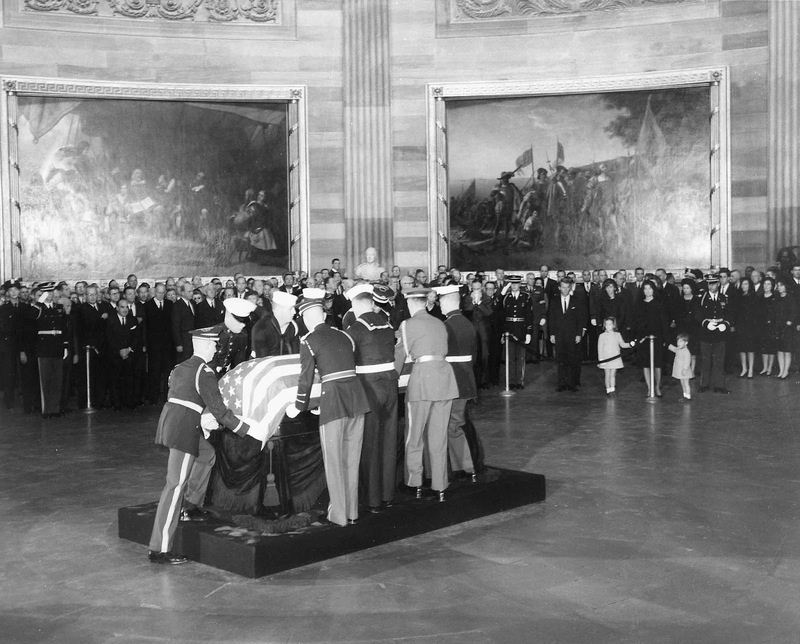 President Kennedy’s body is placed in the Capitol Rotunda in Washington, D.C.
President Lyndon B. Johnson placing a wreath before the flag-draped casket of President Kennedy. The United States Capitol rotunda is the central rotunda of the United States Capitol in Washington. Located below the Capitol dome, it is the tallest part of the Capitol and has been described as its “symbolic and physical heart”. The rotunda is 96 feet (29 meters) in diameter and rises 180 feet and 3 inches (54.94 m) to the canopy. The Rotunda is used for important ceremonial events as authorized by concurrent resolution, such as the lying in state of eminent citizens and the dedication of works of art. The Rotunda canopy features the painting entitled The Apotheosis of Washington, and the walls of the Rotunda hold historic paintings and a frescoed band, or “frieze”, depicting significant events in American history. The Honor Guards at military funerals come from the same branch as the deceased. The president gets men from each branch of service because he was Commander-in-Chief of all of them. They’re actually supposed to be facing out, to protect the body of the president, but Jackie thought that JFK looked lonely and had the honor stand facing him. (Photo credit: George F. Mobley / National Geographic). I was 13 in November of 1963, in Freshman year of St.Patrick's, and with my girlfriend and her family ,stood in line for hours, living only 6 blocks from the Capitol, waiting to the wee hours to pay our respect to President Kennedy. My parents saw me walk by the coffin, on t.v., at home. My friend, Jane Medico, lived on East Capitol Street, and I, Theresa Luskey, lived on 6th St.,S.E. Some things stay in your mine, over the years. One correction: It is customary in the United States for honor guards to face towards the casket -- you can find similar images from previous occasions in the Capitol rotunda. So, this is unlikely to have been done at the request of the President's widow. The US practice is in contrast with Canada, the UK, and many other countries, where the honor guard faces outwards. But we've never done that here.